active 3.5 year old who demands my full attention and you are left with no time or desire to blog. However, I am now 9 weeks pregnant and starting to emerge from the fog of the first trimester (though I technically have 3 more weeks left in this stage). •Joycie has christened this baby as “Pumpkin”. I think it’s due to us telling her about the baby right after our church’s fall festival. But it is cute, so until we now if it’s a boy or girl the baby will be referred to as Pumpkin. •Our first doctor’s appointment was at 6 weeks. During that visit we learned our due date is July 11th. 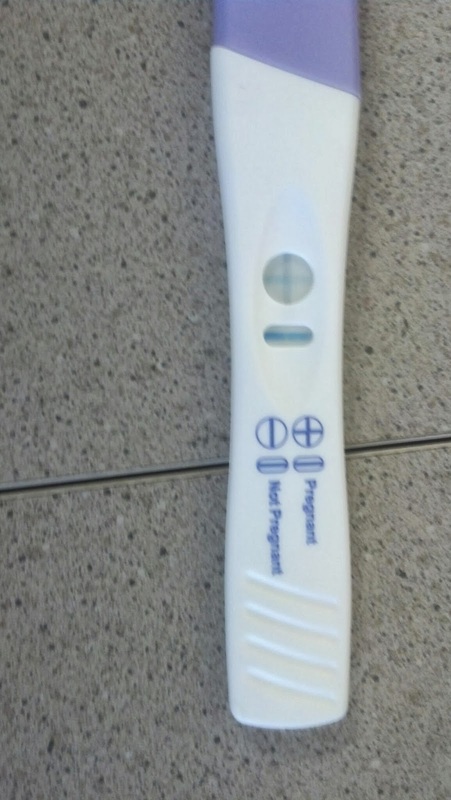 Pumpkin had a strong heartbeat that we were able to see on the ultrasound, and all of my labs were perfect. •Last Wednesday, I had a bleeding scare. I never spotted or bled with Joycie, so this sent me into a frenzied tailspin. Thankfully, my amazing doctor was able to see me immediately and diagnosis the problem. I have a small (less than 1 cm in size) hematoma. Per the doctor’s orders, I spent the Thanksgiving holiday on bed rest, and am still on limited activity until our follow-up appointment on the 16th. •My doctor thinks the hematoma will resolve itself quickly and I can resume my normal activities with the appropriate modifications. •Unlike my pregnancy with Joycie, this time has been full of morning sickness. Thankfully, crushed ice and Zofran make it bearable. I’ll be back later this weekend to share the first baby bump picture and what’s happening with Pumpkin’s growth. Until then, have a great day! Tonight our church launched our Fall Revival. The pastor, Bro. Rick Brown, preached a sermon from Acts 4:31. He titled the message "A Picture of Revival". During the message, Bro. Rick challenged us to examine our prayer lives and determine if we were merely saying prayers or if we were truly praying. I had to admit that too often my prayer life consists of hurriedly mumbled prayers before I drift off to sleep. After hammering home the point that pray is CRUCIAL to a revival. Bro. Rick taught us that to have revival the Holy Spirit has to have reign over our lives and challenging his power thru us. The third point was that to have revival God's people need to be reading and studying the pure Spirit-inspired word of God. This point truly challenged me to reevaluate the time I spend in God's word. I was convicted that I do not spend time in God's word daily. Lastly, in order to have revival, there have to be people - God's people who are willing to surrender their lives to the will of God. Bro. Rick ended his message by challenging the congregation to stand if they were willing to embrace a revival. I rose to my feet without hesitation. I know that I am a child of God and that my salvation is secure. However, I know that I need to be doing more for my Savior. So the plea of my heart has become "Revive Me, Lord, revive me". Yesterday was probably the worst day of parenting that I have ever experienced. Before I delve into the details, let me give you a bit of backstory. Joycelen has NEVER been a big fan of vegetables. Even as an infant, she gravitated to fruits, dairy, and protein over veggies. Early on, friends and family assured me this was normal, so I did not press the issue. When she transitioned to table food, the dislike of vegetables remained.....then she turned 2 and began to refuse to eat anything other than chicken nuggets, yogurt, milk, cheese, strawberries and bananas. I worried at her limited food choices but was assured by her pediatrician that it was fine - she was exceeding all of her developmental milestones, was at an appropriate height/weight for her age, and that her eating habits would change again. Now she is rapidly approaching age 4 (how did that happen) and I have noticed another sharp decrease in her food choices, and she still refuses to eat a vegetable. After a lengthy discussion, Micheal and I decided to institute the 1 bite rule. Joycie has to try 1 bit of a new food after day. We sat down with Joycie explaining to her that she needed to eat a variety of foods so that she could grow-up big and strong, and she agreed to try a green bean at Sunday lunch. Well, Sunday lunch came, and Joycie staunchly refused to even taste the lone green bean I offered. As her refusals continued, I felt my frustration rise and pretty soon in a moment of angry, I told her that since she refused to eat her green bean she would not be going to dance class. Of course, this managed to do nothing to help my frustration levels. Somehow, we made it thru the rest of lunch and returned to our home (did I mention all of this transpired in front of our extended family) where Joycie went down for a nap, and I crumbled into a pile of tears in Micheal's arms. After a good cry, Micheal and I figured out how to extract myself from the corner that I painted myself into. When Joycie woke up from her nap, I apologized for my behavior and told her that I wanted her to be able to go to dance but that I also wanted her to learn to like new friends. I assured her that I would never force her to eat something she truly disliked but that she could not say she did not like something if she never tried it. I explained that at dinner she would be able to choose the new food she wanted to try and if she took a bite then she would be able to attend dance. Joycie agreed and at dinner chose to try a green bean. She picked out the green bean she wanted to try, bit into it --- and GAGGED! I tried to encourage her to quickly swallow it done with a drink of tea but the gag reflex was too strong. But she tried, so she is going to dance class later today. I'm back....again. What can I say? Life got busy and blogging fell by the wayside. I think I have finally worked the kinks out of new schedule and ...maybe...just maybe things are starting to slow down a bit. So hopefully, I can post with a bit more regularity. But even that may only be once a week. But something is better than nothing...right? I have a started a "flex" schedule at work. Basically, I have every other Monday off from work. These days off are GREAT. They allow me to spend the day with Joycie, catch up on housework, and just enjoy some downtime. Joycie started dance classes last week. She is taking ballet and tap. Her class is once a week, and happens to fall on Monday - which means twice a month I am able to take her and pick her up from classes. She LOVES dance, so much that she didn't complain at all about having to wear her hair in a bun. And this is the child who absolutely refuses to wear her hair up. I survived the Insanity workouts. I lost 10 pounds in 2 months. While that's not a HUGE amount of weight, I felt pretty good about - given that my eating habits were less than stellar during this time. Micheal and I have joined a Crossfit box and will be working out together at least 3 times a week. I can't begin to tell you how happy this makes me. Additionally, we are relocating our home gym to his parents pool house - so that he can start working out with his Dad. The plan is that while the guys are working out - his Mama and I can be whipping up some healthy meals. Can you tell the entire family is on a health kick? Micheal and I are also going Paleo. We have done this before and found that it is an eating style that works for us. While I will be following it closely (think 90/10), Micheal is more 80/20 as he has to have his grits for breakfast and a few corn chips to top his chicken salad. Well, there you have it. A quick update on the life and times of the Lee family. So tell me what's been happening with you? If you know me in real life or have been following my fitness journey then you would know that over the past 3 years, running has become a big part of my exercise routine. Especially for the last 2 years, where I have ran 3 days a week with my favorite group of girls, every single week. But over the past 4 months, each of our schedules has gotten busier and running together 3 days a week became difficult.Then injuries, illnesses, and dance recitals came along and soon we were running only 1 day a week - and we found ourselves dreading that run. Two weeks ago, we started talking and realized that while we love running, we are a bit burnt out at the moment. For 2 years, running has been the only thing we have done in the way of exercise (at least with any true consistency) and we all wanted needed to shake things up. Yep, that is the Insanity workout. And if that wasn't crazy enough, our entire running group has committed to doing this program for June and July. The workouts look TOUGH. More challenging than anything we have ever done. And I think the challenge is going to transform our bodies and our minds, so that come August we will be ready to lace up our sneakers again! What do you do for exercise? 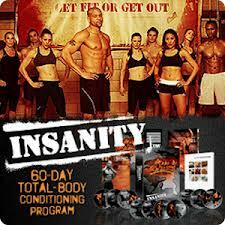 Ever tried Insanity?